So, in an effort to catch myself up on all things Umi-chan related I ran into this tweet. This will be extremely nice for collector's on the Western side of the world to own a physical copy for Vita. Not only that, but it'll be rather limited as well which makes doubly nice for a collector's item. Initially, I thought the ++ meant something rather new included. Such as the dream of getting Shun possibly included, or additional stages and so forth. As the official Vita Western version was named Sayonara Umihara Kawase + when Agatsuma released it back in 2015 on PSN, and Umihara Kawase is no stranger to re-releases with additions and improvements I was expecting a similar case. Sadly, the Tweet feed states (by the publisher anyways) that there's going to be additional art work in this release and only that. Even a confirmation when an individual asks "plus = first and third game, plus plus = still first and third + new artworks?" to which they receive the response of "Yes exactly. ". Now, how much additional art work this means could be an entirely different story. Nonetheless, I think this'll be a great collector's item to pick up. As of right now, the website doesn't have a listing for Umi-chan so I wanted to make this thread for anyone that was curious on purchasing it, and to inform those that would be when it goes up. The Japanese version is very cheap due to coming out two years ago and selling decently. Playing the game in Japanese just requires a translation guide. The new artworks will be viewable on the Internet and will probably be included in some future Umihara Kawase game. What would you rather have, an expensive limited edition copy or an increasingly cheapening copy with slightly fewer features? Even as someone who is only interested in physical Umihara games (seriously, the Switch game BETTER have a physical release in all regions), I'll pass. I already have the Japanese version of Chirari and have no trouble navigating it. While I most certainly understand your problems with such a thing, especially given the recent digital releases, I feel this is also a sentiment that will be shared by some others as well. Very understandable, given the sheer number of re-releases that Sayonara has been getting in the past few years. In fact, I'd normally be more inclined to think the same thing myself and I entirely respect it. Realistically, there's no reason for anyone to get it. Sayonara is already available on 3DS, PC, and Vita. We're not even counting the VR release and the upcoming Switch trilogy, and this just sounds like it'll be a physical bare bones release. So, I'd estimate at around 29.99 - 39.99 USD for the purchase price (if they plan on operating similar to LimitedRunGames). When you think about all of that, digital is easily the way to go. It's far more appealing, and significantly cheaper. Especially if you can get Sayonara on a Steam sale? Goodness! Heck, the whole trilogy on sale is a steal. but there's always that appeal of having a physical release, and that's what makes this enticing. It's also why I brought this up, which is something you had addressed as well. Cost. and this is actually really interesting to get into. You had mentioned the cheapening cost of Sayonara, but we've definitely been checking out different places as the title has more than retained its value if you're looking to get the game in the West. Importing a physical copy of Sayonara on the Vita, based upon the places I've checked that ship westward with no middle men fees, the prices are virtually identical if not more than what I'm estimating the game to be sold at. Ebay doesn't list the game any cheaper than 29.95 USD for a used complete copy. Play-Asia is asking for ever more than that. SolarisJapan is easily the most ideal, with a brand new copy, but that's still 29.97 so you could easily wait for the price to be released for this limited one and compare. You can go through other places like Amazon.co.jp, Yahoo Auction, etc, but the further you venture outside the normal path to cheaper listings the more likely you're needing to go through a middle man. So say if I was looking to buy Sayonara for the first time, I'd have to use my Japanese contact to get the game cheaper through other means that are not normally accessible for shipping outside of Japan. For example, there's two listings I found on a usual go-to spot I use that cost roughly the same (19, 20 USD). By the time the shipping fee is adding and the handling by my contact, I'm going to be spending roughly the same I would getting it on Ebay for that price range. In my humble opinion, that makes this upcoming physical release compete quite nicely with the current priced versions of Sayonara on the Vita. That might not be your case with where you live, or where someone else might, and there's also cheaper auctions that can go up. However, this is what's available as of this moment and for those of us that have to go through those means this is a really wonderful thing. Regardless of any personal thoughts on the worth, I genuinely believe this is really a fascinating moment for those that enjoy Umihara Kawase as releases thus far have only been limited to digital copies in the West. This could potentially be used as a gauge for companies to see how well this sells for potentially more physical releases down the road. Grandia was picked up by Sony only after they saw how well the Lunar series did, and that was all thanks to Working Designs taking a chance. Is that a likely scenario? Probably not, but it still is a rather big moment for any Umi-chan fan. At the very least, it'll make headlines in various gaming blogs and outlets which will then further draw attention to the series once again. That's always a plus. Is it worth purchasing? That's all personal, but I think it's worth bringing up because this will highly likely be picked up by scalpers and resold at incredibly inflated prices. 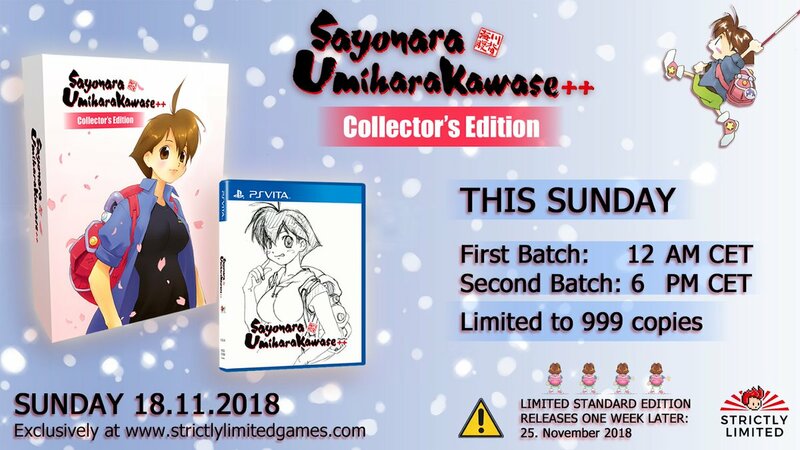 That, would truly be a shame as any collector knows just how expensive it is to collect Umihara Kawase merchandise and games as it is. I'm certainly looking forward to getting this (if it doesn't sell out first, of course). Even if the only addition is some new artwork, I think it'll be interesting to see that. Same here, I'll definitely buy it even though I'm never getting a vita. I mean, come on, that cover though!!! (I have a problem). I hope we'll see a new game in the works if this sells well.. Strictly Limited Games have also recently announced that their game covers will not display an age rating, so as not to distract from the cover artwork. Great news! When you think about all of that, digital is easily the way to go. It's far more appealing, and significantly cheaper. Especially if you can get Sayonara on a Steam sale? Goodness! Heck, the whole trilogy on sale is a steal. Speaking of which, there's a big Degica sale happening on Steam at the moment and the Umiharas are 70% off. I think most people around here who are interested in the PC versions probably already have them, but if not, here's a great opportunity. You beat me to the punch, KawaseFan! I was just about to say that I had noticed Deciga's games are featured as part of a sale and that includes Umihara Kawase, which is fantastic! Cyrene also brought up a good point that I forgot to cover in my initial post. Someone had asked if the cover art, featured in the tweet I had posted above, will be the final work released and they confirmed that it is not. However, it sounds like there's also a possibility it will be a reversible. I really have been enjoying the current trend of more games offering dual sided art work, and I'm really glad to know Sayonara Umihara Kawase ++ will also feature that. I wanted to make a real quick edit. It appears that Strictly Limited Games does quite a good job notifying their followers about a games release. They've not only pinned a tweet for their release this month, but also several tweets about how many copies will be available, and the exact date. They even included a link to a website for conversion of the time to your location. This will definitely be a huge benefit to making sure you can snag a copy if you want one. I hadn't checked recently. I remember them being sub $15, but it seems the price has gone up. I still have my Japanese copy from 2015 and just don't need to get another one in general. I'll be reserving my money for the new Switch game. Also, I don't see digital anything on consoles as a "steal" if there's a physical version. Even if the physical is initially more expensive. Hearing that Limited Run Games would be publishing it made it sound expensive. But if it's more like $30, then yeah, that is about equal or better to what the Japanese version is now. Trophy list has been posted. Earn all available Trophies for Sayonara UmiharaKawase ++. I still think the trophies are dumb. Horrible lack of representation for the Original, plus things like "watch all tutorials" "watch a replay" and "fail 50 times on a single level" are dumb. If I were to design them, getting All Unlocks and All Golden Arrows would be the extent of requirements. Updated news from Strictly Limited heavily hinting at a release sometime this month. They've been aiming for the end of the month, generally, for releases so I would expect it to be around a similar time for this one. Hasn't happened yet? Okay, I'll bite. Might change All Unlocks. I've ordered my copy! Thanks, CyanideBlizzard! My pleasure! Helping keep other Umihara fans informed is the least I can do as payment in return for having such a fantastic place for us to gather. I also got my set, and I'm incredibly impressed with the quality. The box itself is higher quality than I expected, especially in comparison to retail collector's. Feels sturdy, and opens from right to left on the bottom side. It's also rather deep, and not necessarily wide or tall which makes it fit fairly nice for storage purposes. Toshinobu Kondo provides a rather nice page of information talking about his history with gaming and his personal fondness for Umihara Kawase. The back of the paper is the same note but in Japanese, which I thought was a rather nice touch to provide the original transcript and the translation. This is really where we get into the meat of things. There's a lot of material in here. On the far right we've got a folded poster of Umihara Kawase in some swimwear, and going left we've got a set of stickers. Or I believe they were? I actually only took photos and then packed the box back up before getting back to work so I'll actually have to check that out again because I want to make sure, but I'm 90% sure! Either way, moving on we've got a replica cartridge with the Western logo for Sayonara Umihara Kawase ++ alongside the original SFC artwork. As mentioned in their previous posts, the cartridge is not playable, but it definitely feels/is authentic. Was a really nice touch, and has a mold for it at the bottom of the box to be nicely inserted into. Then we've got the Vita game itself, alongside the soundtrack. It's really nice for both of these things to be offered, despite the fact that the game does not add much and I believe the soundtrack is the same one that's already available. Still a nice addition to the set, even if both are easily acquirable. The art book strikes me as the same type you see in NIS America anime Collector's box sets. Hard covered and pages appear to be semi-glossy as well. 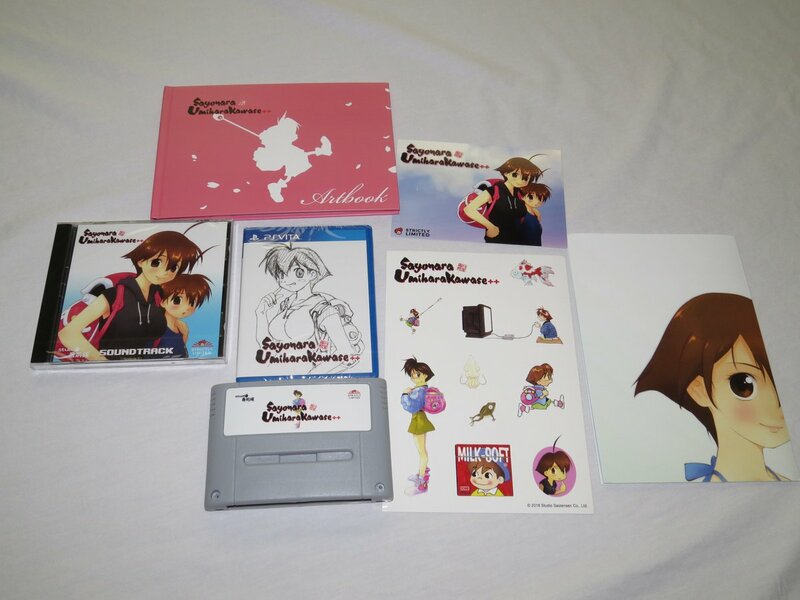 It's a rather quality item, and outside of Toshinobu Kondo's personal doujin releases the first time we've seen an art book of Umihara Kawase. Overall, I must confess I'm extremely impressed. This was more than worth the purchase, IMO, and very well handled by the Strictly Limited team. I didn't know what to expect, since I've never bought from them before, but they did a really nice job handling this set. You get the impression that they really wanted to handle this with love. Hopefully those who ordered a copy will be just as pleased! He gets "messages from around the world"? How can I send him one? Absolutely! Mine arrived too and I'm definitely impressed. I'm especially pleased with the artbook; in addition to the various sketches and character art, it had some pretty interesting details about the development of the earlier games, which was great. Oh no!I'm late,the limited edition has been sold out.Really like this game.Wonder if any of you have some spare copies for me to purchase?Thanks!